Finally, Retired Clinical Counselor Reveals the Secrets Successful Psychiatrists and Psychologists Don't Want You to Know. "How to Stop Your Depression Now!" To Win the War Against Depression." "Feeling like my old self again""
Thank you for writing this book! I've been depressed for years. Therapy just didn't work for me. Your book finally gave me a ray of hope. I'm beginning to feel like my old self again. Dear Friend,Depression is an illness that many people often sweep under a rug. However if depression is left untreated... Your life can become a living nightmare. Depression is a growing epidemic in the US, but it never gets the urgent attention it deserves. You need help and you need it now. But you say, "I have insurance, why not just see a therapist." You may not know this, but even though you may see that therapy is covered under your plan, many insurance companies limit the number of visits you are allowed. Worse yet some plans have an extremely limited selection of approved therapists, many of whom just put up a sign and call themselves therapists with no credentials. Additionally talk therapy is a major time investment - meaning taking time off work and away from your family. Imagine having all the information you need right at your fingertips to use or sift through on YOUR schedule. You no longer have to deal with the all of the "technical" books out there that leave you asking yourself "What the heck does that mean?" And you won't need to rely on a therapist who can charge up to thousands of dollars with no results. "Stop Your Depression Now!" isn't like other books out there that deal with depression. This book is easy to read and easy to understand. But more importantly this book gives results. With "Stop Your Depression Now!" you are put in the drivers seat. You are able to quickly understand your depression. Understanding your depression is half of the battle. I will help you win the war. The Depression Indicator Test Once you take this test you will know if you are depressed and then find out what to do about it. Quickly identify which type of depression affects you. Some depressions are much worse than others. You'll save hundreds of hours sorting through all the mis-information out there by simply reading "Stop Your Depression Now!" Learn how to prevent depression from happening again. If you've had one bout of depression, you are likely to have another. 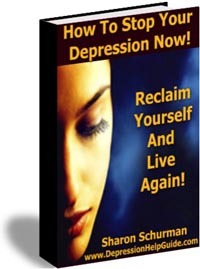 But if you follow the simple tips in this book you can avoid depression from happening again. Identify depression in your loved ones.how they talk, how they act, and how they think. Often, people do not even know that they are depressed. This affects work and personal relationships. Discover the pitfalls of depression recovery and how to avoid them. Knowing the potential pitfalls bring you that much closer to "getting back to your old self. Learn what and who you need to avoid during your recovery. Find the best treatment for your personality. All treatments are not created equal. Treatments that do wonders for others may do absolutely nothing for you. Discover if you are at a higher risk for depression. Imagine being able to identify warning signs before you even become depressed. Learn how a Toxic Relationship can ruin your self-esteem. Some people are as threatening to us a disease like cancer. You'll learn steps to identify and get rid of those "toxins" polluting your life. Understand how any serious health problem or even a simple elective surgery can cause depression. You'll be armed with the RIGHT questions to ask your doctor and know what you must demand from him. Get the lowdown on what to expect from antidepressant medications. You'll be informed and able to insist on the right prescription for you. So how am I able to deliver these results? I am a retired, licensed clinical counselor. I spent my life treating depressed families, individuals, and corporate clients. Now I'm sharing my years of experience with you. "Stop Your Depression Now!" is the complete solution for anyone who wants to overcome his/her depression. I have helped hundreds of patients using the techniques in this book. Now it's your turn. "Discovered the Cause of My Depression"
Sharon, I love the book! I finally realized that I was in a toxic relationship that was causing my depression. I am now on the way to becoming the confident, independent woman I always knew I was. Sharon, Let me be blunt. I usually think that books about curing depression are junk. However I found your book to be concise and easy to read. Keep up the good work. "Finally Got the Answers We Needed"
Thanks for this great book. My husband had triple by-pass surgery six months ago and has been so down in the dumps ever since. His doctor never told us what to expect. After reading your book we finally got the answers we needed. Thank you again. I am so sure that you will love my book that I offer a 90 day unconditional guarantee. If you are not 100% satisfied I will cheerfully refund your purchase price – no ifs, no buts, just your money back! You could spend hundreds, even thousands for talk therapy, or other self-help guides. But you won't have to pay that with "Stop Your Depression Now!" You will be able to save time and money, but most important, you will have the "Recovery Power" to win the battle against depression. And isn't that what you've been waiting for? You'll receive all this for the one-time price of $17.00. P.S. "Stop Your Depression Now!" is unlike any other depression book out there. Don't just hope your depression goes away. Take control of your life TODAY. P.P.S. If you don't order "Stop Your Depression Now!" right now, how do you plan to get your life back on track? P.P.S.S. I look forward to getting a letter from you, telling me about your success. Even though I get and enormous amount of mail, please write to me. I'd love to hear your story!